Oil and gas industry: What's an entry-level job like? What’s It Like to Be an Entry-Level Worker in the Oil and Gas Industry? Workers on the La Muralla IV exploration oil rig in the Gulf of Mexico in 2013. There is entry-level, and then there is entry-level. If you want to go into the industry straight out of high school, expect to work hard for your money. We’re talking 12-hour days of repetitive heavy labor for seven to 21 days in a row, followed by a week off and then right back at it. If you can impress upon your boss that you aren’t a completely useless worm, after six months to a few years you may be able to move up to some sort of equipment-operator position. After five to 10 years performance as a good hand, you may be able to get into some sort of supervisory position if you can demonstrate leadership capabilities and initiative. You will likely top out on your pay scale fairly early in your career. If you go into the skilled trades, you skip ahead several years in your development and add considerably to your value. You will still need to work hard, but the technical nature of your work will mean you work more with your head, less with your back. The pay is good (often as good or better than a starting engineer), but you will eventually top out on your pay scale midway through your career. Most programs alternate between sessions at school and paid apprenticeship sessions, so you don’t have to go as long without earning a paycheck. Going to university can essentially skip you straight to a supervisory or technical role if you pick the right discipline. (A BFA isn’t going to do you much good in the industry.) Chemical, mechanical, and electrical engineers who go into the industry will make similar money to the petroleum engineers on this website. Once again, you will still have to work hard, but now you will be almost entirely working with your head, not with your back. If you are in an operations-management role, you will start out with people with many more years of experience (who are likely making more money than you) reporting to you. Depending on how you handle it, it can be a great or horrible experience. No matter how you get into it, the industry requires a lot of work for the pay. You’ll spend lots of time either offshore near places like Odessa, Texas; Williston, N.D.; Fort McMurray, Alberta, Canada; or their equally charming equivalents in the Middle East, Africa, or Australia. It’s pretty common for your personal life to suffer as you spend long stretches away from home and may be asked to move regularly. There are lots of opportunities, but you are going to have to put in the effort and time to take advantage of them. When it comes down to it, if you have the aptitude but don’t want to go through a technical or business degree, I would suggest looking at a skilled trade. It’s a lot easier to do it fresh out of school than to go back after you have a lifestyle (kids, mortgage, truck payment) that depends on earning a decent wage. Typically, what are the roles of electrical engineers in oil refineries? 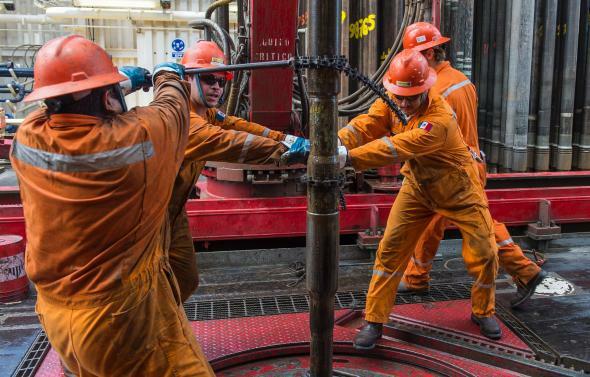 What does it feel like to work on an oil rig? What are typical salaries in the fracking industry for those without four-year degrees?